A noted novelist (Truth and Consequences, 2006, etc.) returns with a generally genial but sometimes-slicing analysis of our buildings and their interior spaces. In the tradition of her earlier work (The Language of Clothes, 1981), Lurie’s new volume proceeds both thematically and chronologically (within chapters). She devotes sections to such types of buildings as private homes, religious structures, museums, schools, “houses of confinement” (prisons, hospitals, asylums, nursing homes), hotels and restaurants, stores and offices. 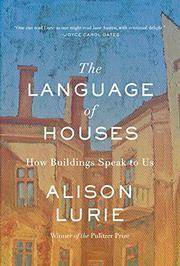 She asks us to consider exteriors: What do they tell us about the building and its intents? What do they tell us about what we’ll experience inside? (Consider: a school that looks like a factory, a museum that resembles a palace, a retirement community that looks like a resort.) Lurie also takes us inside to help us see more clearly what’s before us: an office with cubicles, an elementary schoolroom with rows of desks bolted to the floor, a church that looks like a Gothic cathedral or like a theater complex. The author occasionally inserts a few personal comments, mentioning, for instance, that in her home, a spare bedroom serves the function of the attic (now missing in many newer homes). She also shows flashes of attitude here and there. Having discussed the pervasiveness of electronic devices in students’ lives, she notes how “silence and solitude” have become “either irrelevant or frightening or both.” Although Lurie alludes to multiple nonspecialist sources (and periodically offers quotations), her interest is not so much academic as analytical; on every page, she has us consider something we might not have thought of—e.g., did you ever wonder why supermarkets place ordinary staples (milk, eggs, etc.) very far away from the entrance? In clear, patient prose, the author encourages us to stop and think about what has been in front of us our entire lives.